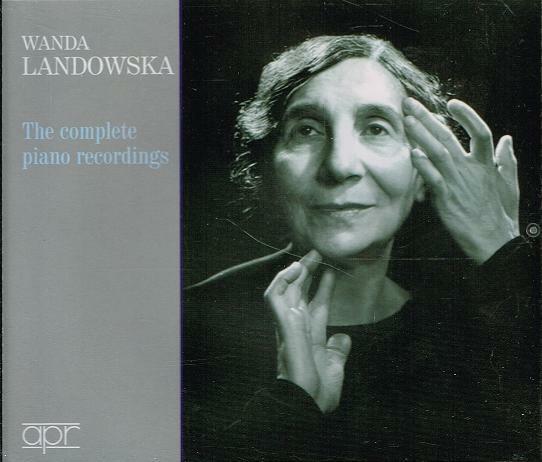 “While Wanda Landowska remains virtually single-handedly responsible for the revival of the harpsichord as a viable instrument for modern Baroque music performance, we must retain esteem for her ability at the piano. Landowska received instruction from Kleczynski and Michalowski in the Romantic keyboard tradition, especially as applied to Chopin. For the music of Mozart, Landowska conscientiously decided to invest the modern piano with a studied touch in order ‘to obtain the color and particularities of the pianoforte’ of Mozart’s time. Her aesthetic asserted that ‘grained sounds, comparable to the tapping of fine hammers, trace melodies of the purest bel canto...the authentic qualities of the pianoforte will be reborn in their freshness and novelty’. The marvelous recording of the ‘Coronation’ Concerto (25 March 1937) with Walter Goehr stands as a testament to her thoughts on Mozart concerto realization. Perhaps even more haunting – or haunted – we have Landowska’s Mozart Fantasie in d minor, which avoids any pesant effect from arm weight and thus embodies a disturbed world of rarified poise that moves to sunny affirmation. Producer and Recording Engineer Mark Obert-Thorn resuscitates those same inscriptions along with the two sets of RCA LPs (LM 6044 and LM 6073) devoted to Mozart and Haydn piano sonatas, recorded 1956-1958. 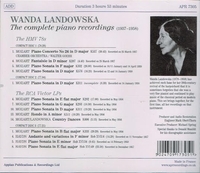 As a kind of dividend, we receive a reminder of the politics of the period from 14 January 1938, in the form of Landowska’s partial recording of Mozart’s Sonata in D, K. 311, a document meant to be thoroughly demolished by the Nazis, who deemed Landowska – despite her family’s long conversion to Roman Catholicism – a Jewish artist (and also gay) whose work should not be preserved. The sonatas in F, K.332 and D, K.576, too, benefit from rediscovered matrices denied to their 78rpm incarnation. We must concur with Virgil Thomson, listening to this magnificent torso of a performance from 1938, that her sense of tonal and dynamic weight ‘is matchless’. Happily, RCA captured her complete thoughts in May, 1956 from her Steinway B recorded at her home in Lakeville, Connecticut (as she later always did). The perfect merger of Mozart and Chopin occurs in the Rondo in a minor, in which Mozart’s vocal style well adumbrates the improvisatory and contrapuntal style of the later Polish romantic. Her rendering of Mozart’s K.606 Country Dances ties his aristocratic style to the ingratiating ländler of Franz Schubert. "Landowska toured European museums inspecting period harpsichords and trying them out, then bought old instruments and had Pleyel make her large touring harpsichord. The most controversial aspect of this instrument was its 16-foot stop, an octave below normal pitch, which gave her instrument a deeper, richer sound than any other....in the early 21st century, that Landowska had been right all along when she said to Pablo Casals, 'You play Bach your way and I’ll play him his way'....She was the Goddess of the Harpsichord, the woman who single-handedly revived interest in the harpsichord and made it a mainstream instrument. By the time she died there were also Ralph Kirkpatrick, Sylvia Marlowe and a few others, all inspired by Landowska and following in her footsteps, but it was pretty much accepted that Landowska was Mount Everest and the others were the Blue Ridge Mountains, at best.